The Hershey's Kiss is an iconic sign of Love. Designed in Sterling Silver , this Medium Flat Back Hershey's Kiss Pendant with diamond accent (Color: H-I, Clarity: I2) shines as an expression of Love. The Kiss measures 15MM in height and 6MM at the base. 18 inch (16 inch with a 2 inch extension) sterling silver cable chain w/ spring lock. 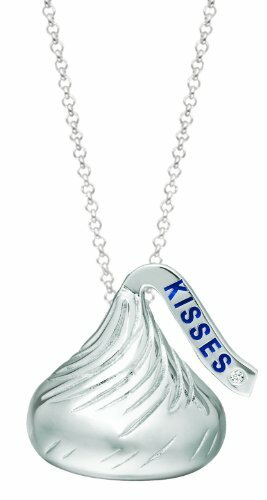 Included in this bundle you will also receive a Hershey's Kisses chocolate tin (Chocolate Included) as well as the official Hershey's Kiss Jewelry packaging. Give your loved one jewelry and chocolate this Valentine's Day. Copyright 2009 The Hershey Company. HERSHEY'S, KISSES, the KISSES wrapped and unwrapped conical configuration and plume device are used under license.